Weather can be dangerous. That’s what The Weather Channel has been telling us for years through videos and stories on their TV channel and website. We’ve been able to witness the most perilous types of weather—hurricanes, tornadoes, tsunamis—through videos, commentary from meteorologists, and abstract maps overlaid with arrows and text. While such coverage can provide important information, it doesn’t necessarily give you the full sense of what’s happening and, more importantly, how you can keep yourself safe from lightning, falling power lines, flying debris, and other storm hazards. These aren’t abstract concepts like maps with arrows and text - these are painfully real consequences. This is where augmented reality (AR) and mixed reality (MR) come in, combining live footage and photoreal, computer-generated objects (trees, cars, etc.) to create an immersive, three-dimensional experience that can mimic any real-life environment. Additional visuals like signs, arrows, and text can also be added. Such technology can take us inside a storm to move around at will, dodging flood waters, lightning, and flying objects, and spying pop-up safety tips about the hazards. This transforms an abstract conversation into one that drives home the risks and consequences of these life-threatening events. How fast and hot is lightning? Mike Betts tells you all about it while mixed reality shows its effects. To move toward such a future, The Weather Channel has partnered with The Future Group to incorporate mixed reality into their broadcasts. 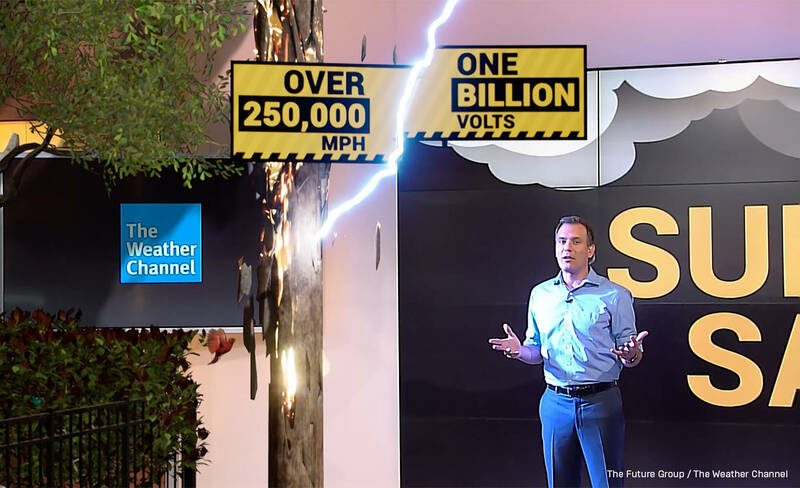 Two videos from this partnership were recently shown on The Weather Channel, the first of many custom experiences that The Future Group will provide to TWC using their Frontier technology powered by Unreal Engine for real-time rendering. 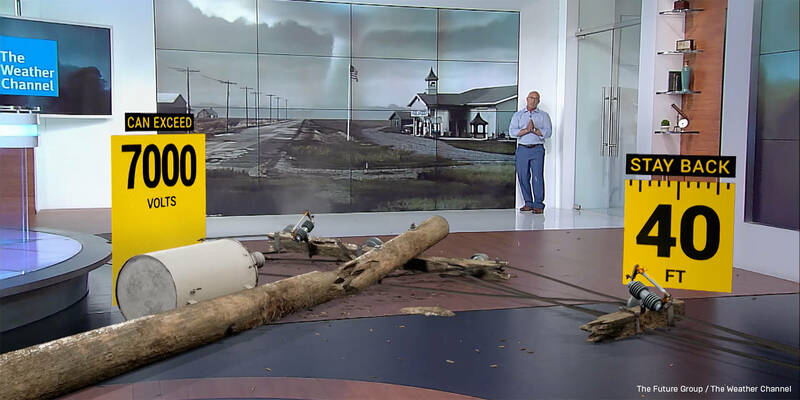 In the first video, which aired on The Weather Channel in June 2018, TWC Meteorologist Jim Cantore narrates the effects of a virtual tornado that appears to be approaching the studio. As the tornado gets close enough to pull up trees and throw around large objects, a fizzing power line falls at Cantore’s feet, and up pops safety information about avoiding such a hazard. 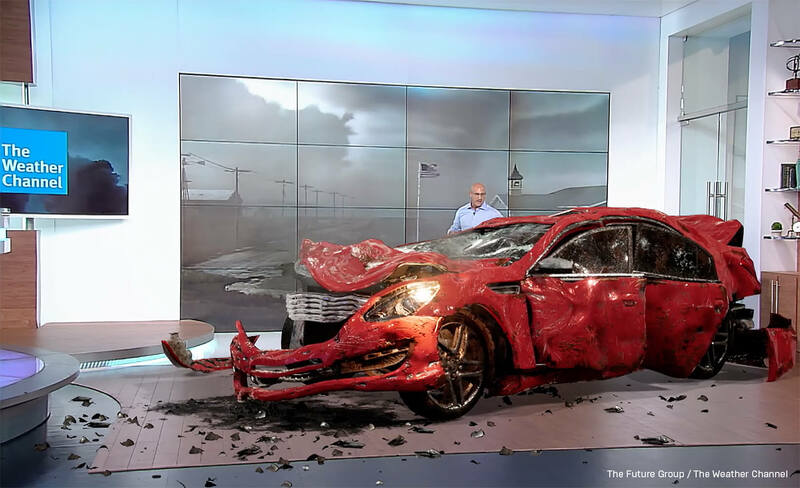 The pièce de résistance comes at the end, when a virtual car is thrown by the tornado and flies into the studio, crashing at Cantore’s feet to billow smoke and dust from its mangled body. Jim Cantore dodges tornado hazards, including a flying car. In a more recent immersive MR video, TWC meteorologist Mike Betts explains why trees explode when struck by lightning. Betts stands just a few feet away from a virtual lightning strike as it replays in slow motion. Photoreal, real-time computer graphics are what make these illusions possible. Mike Betts explains lightning and its dangers. The hallmark of MR, as opposed to traditional technology like compositing, is that the graphics and effects are generated in real time. As the camera moves around, the perspective of computer-generated elements change as well, cementing the illusion that the virtual elements are actually there. Storm-related phenomena that are too dangerous to capture up close on video can be simulated and navigated in real time, and integrated seamlessly with live video and text even with a moving camera. While The Weather Channel’s videos could have also been created with traditional rendering and compositing techniques, matching up all the perspectives for live video and pre-rendered sequences would have taken many orders of magnitude longer than it did with real-time mixed reality techniques. Using a real-time process means a change, tweak, or do-over takes minutes instead of weeks, even with the photoreal objects and special effects shown in the videos. The Future Group, focused on immersive mixed-reality experiences, anticipates providing The Weather Channel with many hyper-real storms, tornadoes, and hurricanes in the future. Watch out, Jim! Tornadoes can carry large, heavy objects over great distances. The Future Group, who aims to be the number one provider of real-time visual effects, appreciates the power of Unreal Engine to achieve their goals. “Besides the powerful real-time capabilities of Frontier powered by UE4, The Future Group leverages our skilled team of VFX, gaming, broadcast tech and creative artists who truly understand how to create breakthrough experiences for broadcast,” says Lawrence Jones, EVP of the Americas/ECD of The Future Group. Oystein Larsen, VP Virtual at The Future Group, adds that when it came down to pure rendering quality and ease of use, Unreal Engine 4 was the obvious choice. “Our selection of the engine for real-time visual effects gave us the tools to really push the edge of live production,” he says. Want to create your own mixed reality experience? Get Unreal Studio today to import your scenes to Unreal Engine!